I started stamping, scrapbooking and cardmaking in the late 1990's when a coworker of mine became a Stampin' Up demonstrator. In the mid-2000s I didn't do as much - maybe an occasional gift tag. In 2007 I made a nice scrapbook for my trip to Europe and that was my lone project in many years. I got back into stamping regularly last summer when I decided to make a Father's Day card and ordered some stamps from Stampin' Up. Then I started stamping regularly at first with Stampin' Up items mostly, then I discovered the world of Splitcoast and Papercrafts and blogs and new stamp companies. I quickly branched out and found myself spending all my extra money on stamps and supplies of all kinds!! So, after my crafting supply inventory started to grow I rearranged my extra room and now it's the dedicated craft room. 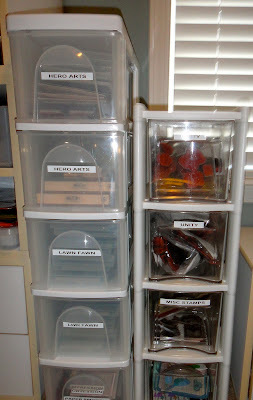 Today I'm posting some pictures of how I store my growing stamp collection. Here are my Stampin' Up stamps, I keep them together because the are packaged alike and all nicely labeled. I can get to them easily this way. I have these two plastic storage units for my other stamps. I took out my Dymo Label maker and labeled each of the drawers with the name of stamp company. I found it hard to keep up with all my clear stamps - the bags they came in seemed to tear so easily. 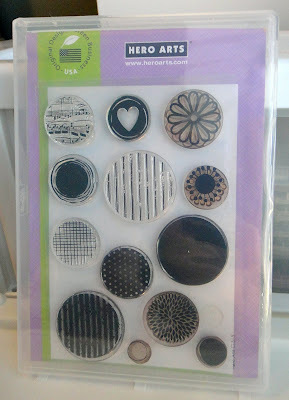 So, I started buying the empty plastic clear stamp cases from Stampin' Up. You just have to cut the paper packaging a little on the top or bottom and the whole thing will fit in the plastic case. Plus, these fit great in the plastic storage that I keep them in. The taller one I bought recently at Lowe's. Here's what they look like in the drawer. You can even fit one in the front of the drawer and one on the side. I keep the smaller stamp sets in CD cases. I recycle ones that I already have and also order them from Papertrey Ink. Hats off to you, Donna! I can't get over how organized you are! This is so inspiring! Donna I came over from a card you shared on flicker and boy am I glad I did! My crafty space is a mess and these are great ideas to get a little more organized, thank you! Great ideas on stamp storage, TFS!